I don’t know why I’ve been finding the 2016 Scheepjes CAL a bit tougher to blog about than Sophie’s Universe. Maybe it’s the square-by-square construction of the blanket, or the fact each square is a single colour that’s been stopping me going photo crazy? Either way, I SHOULD have been blogging about this project – because it’s beautiful and I am loving it! If you haven’t started your Last Dance on the Beach blanket yet, there’s still time! Scheepjes are releasing a square pattern a week, and seemingly have no plans to delete all the patterns after the “official” weeks are up – so if you were waiting to see how others are finding the project, maybe this will help! I am currently 6 weeks, and 6 beautiful designs into the project (although week 7 was published this morning so I need to get hooking!) – which means I am halfway through the squares. The CAL is a 14 week project, with the first 12 weeks consisting of making the squares, and the last 2 weeks being spent joining them together and making the border. As I recently discovered when making the Lydia blanket, I am the perfect candidate for making a blanket which is made out of individual motifs. I crochet on my commute every day, so projects which are portable are great for me. Anyway, enough waffling! Wanna see some squares? We kicked off the CAL with a square from Esther, which used strategically-placed popcorn stitches to evoke memories of walking along the beach and picking up bladderwrack seaweed. This really reminded me of childhood trips to the beach – what a way to start the project! I think starting week 2 was the most exciting bit of the CAL for me so far – I had never encountered star stitch before and it’s b-e-a-u-tiful! I had to go up from a 4mm to a 6mm hook for this to work to gauge, but I love the squishy, textured look it’s given me. I will definitely be using the star stitch again – thanks Kirsten! Yummy squishy star stitch for week 2! I’ve been an admirer of Tatsiana’s designs for a long time now – and her square was exactly what I would’ve expected her to design! She has such a distinctive style, with clever use of overlay crochet and texture. Her square didn’t disappoint with its popcorns and front post stitches to create waves. This was a really satisfying make. Week 4 was a real showstopper! This square is so evocative, and the stitch so cleverly designed, I fell completely in love with it. I’ve seen some people using this wave stitch to create scarves and accessories on the Scheepjes CAL Facebook group – and I might have to follow suit! This was my first time working one of Atty’s patterns, and I’m super-impressed. This square is so calming to look at – it really reminds me of my holiday to Florida last year, seeing the footprints of the birds on the beach. Nerissa’s style is written all over this square – she specialises in these classic designs with a little twist. I found this square really calming to make as well – it requires very little counting, and there’s something very soothing about that! I love how effective this simple design is – it’s just perfect! I know from reading her blog, that Carmen had a bit of a “journey” getting to this design for her square, settling on the corner to corner (C2C) design after battling for a while to get a more complex design to fit the allotted square size. I’ve got to say, I’m really excited to get a C2C square in here! I love the C2C stitch pattern – I’ve used it a load of times for fast blankets. The simple texture is just lovely- Carmen says it reminds her of sand, and it’s hard to disagree in this sandy colour. So that’s where I am with the CAL so far! I couldn’t resist a cheeky snap of all the squares together – a little preview of the finished blanket if you will! Eeeeeee! I’m so excited to finish now! Look at them all together! As I said at the top of the post, the pattern for week 7 has just been published – and I’m really excited, because the heart square is the one that caught my eye in the original promotional pictures for the CAL. I will be hooking away furiously this week! 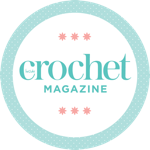 I’m making my blanket using the Scheepjes colour crafter yarn – a lovely premium acrylic, which is super soft and comes in a range of colours. The colour packs for this blanket come in six variations – the three colourways, Dance in the Sea, Dance in the Rain and Dance Under the Stars, each of which is available in either colour crafter or merino soft yarn. I chose colour crafter because blankets in our house tend to take a bit of a beating, so I didn’t want to invest in merino yarn. If you have a bit less animal hair in your life, maybe the merino is for you – this is a really special blanket, it could be worth the investment. The good news is that whichever pack you go for, Scheepjes will make a contribution to Mind, the mental health charity, in memory of Marinke Slump (Wink) from A Creative Being, whose vision sparked this CAL project. Sadly, Wink lost her battle with depression before she could finish designing this blanket, which is why her friends from the blogging community have stepped up to help. I bought my colour pack (Dance in the Sea) from Wool Warehouse. Although I originally thought I’d go with the Dance in the Rain pack, with its purples and greys matching our decor a bit better, I’m delighted I went with Dance in the Sea. I’m still not ruling out another colour pack – it’s for a good cause after all! *This post contains affiliate links. Clicking on them won’t cost you any extra money on your purchase, but will help me with the running costs of Elsie Pop. I love that star stitch too – so pretty! Can’t wait to see it all finished, I love how those colours are working together. I love the different textures on each square, it’s going to be an amazing blanket when it’s finished. The square look gorgeous together! wonderful to “meet” you on craft schooling Sunday, hope you’ll join us regularly, could use some more new crochet projects! I love the patterns and I love the colours you picked! Thank you for sharing at The Really Crafty Link Party! Pinned!